Hyderabad, Mar 13: After the prestigious project RRR launch, this is the first time for Rajamouli and the entire unit to meet the Press. 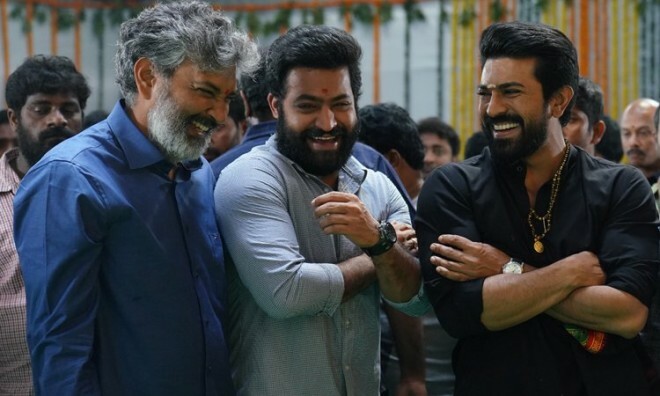 Media wasn't invited for the launch of RRR and Rajamouli who routinely reveals the artifice of his movies on the day of launch surprisingly stayed speechless on RRR till today. And Yes, the ace director is finally going to break the silence on RRR tomorrow at the Mega press meet. Be that as it may the fans and general audience are keenly waiting to know the details of this Mega Multi-starrer. There have been contemplation about the conspiracy and characters of Tarak and Charan in the media. Yet the media kept on leaking the secrets about the female leads and the backdrop of RRR but the team RRR chose to remain silent about the rumors. Will Rajamouli reveal every detail about RRR tomorrow (or) is it going to be a casual meet about the progress of the film? RRR is aiming for summer 2020 release, which means it is more than a year away from hitting the screens.